Practice or occupational enrolled nursing assistants, other healthcare assistants or any person who is not medically trained but is involved in carrying out spirometry or wanting to carry out spirometry. 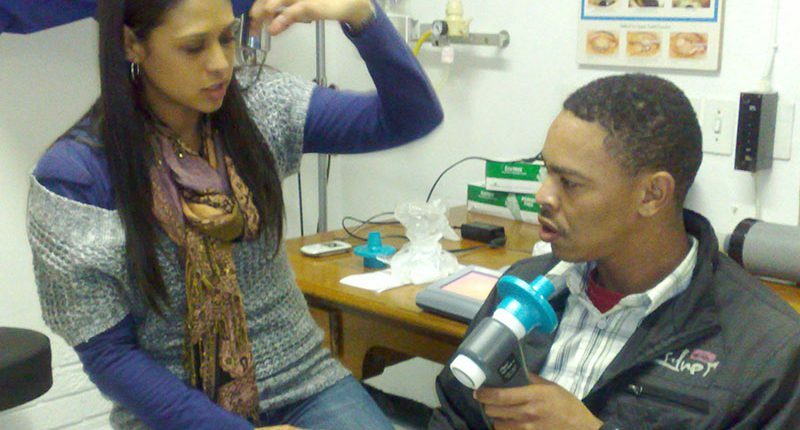 With spirometry being used more and more extensively in South Africa, so healthcare assistants or persons with no prior medical training are taking on the important role of recording accurate and meaningful spirometry measurements. Therefore this course has been designed to deliver information for basic knowledge and practical skills. The course utilizes a combination of teaching methods including PowerPoint presentations, practical demonstration and tips, verbal interaction and mentored practical sessions. A certificate of attendance is issued to the learner at the end of the day. An up-to-date spirometry practical manual using current South African guidelines and draft guidelines (i.e. the most current information available)is provided with everything the student needs to know for practical spirometry testing as well as to refer back to when continuing with spirometry in the workplace. Spirometers x1 between 2-3 students and all disposables will be available for training. Please bring own calculators, pens and paper and wherever possible your own spirometer if it is portable together with disposables and the manual that goes with the machine. Course fee includes a comprehensive manual, use of spirometers and disposables, refreshments and a light lunch. Also includes a Certificate of Attendance.